Following iPad light painting, we’ve made two films of alternative futures for media. These continue our collaboration with Dentsu London and Timo Arnall. We look at the near future, a universe next door in which media travels freely onto surfaces in everyday life. A world of media that speaks more often, and more quietly. Incidental Media is the first of two films. The other film can be seen here. Each of the ideas in the film treat the surface as a focus, rather than the channel or the content delivered. Here, media includes messages from friends and social services, like foursquare or Twitter, and also more functional messages from companies or services like banks or airlines alongside large traditional big ‘M’ Media (like broadcast or news publishing). All surfaces have access to connectivity. All surfaces are displays responsive to people, context, and timing. If any surface could show anything, would the loudest or the most polite win? Surfaces which show the smartest most relevant material in any given context will be the most warmly received. I recently encountered this mixing in surfaces. 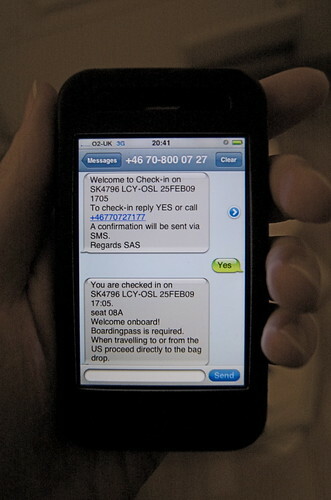 An airline computer spoke to me through SMS. This space is normally reserved for awkwardly typed highly personal messages from friends. Not a conversational interface with a computer. But now, those pixels no longer differentiate between friends, companies and services. 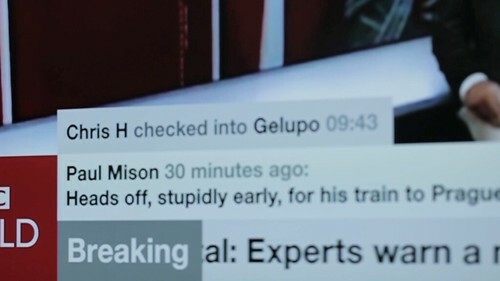 How would it feel if the news ticker we see as a common theme in broadcast news programmes begun to contain news from services or social media? I like the look of it. The dominance of linear channel based screens is distorted as it shares unpredictable pixels and a graphic language with other services and systems. 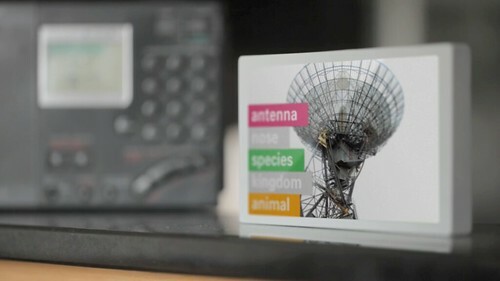 This screen listens to its environment and runs an image search against some of the words it hears. I’ve long wanted to see what happens if the subtitles feed from BBC television broadcast content was tied to an image search. It feels quite strange to have a machine ambiently listening to words uttered even if the result is private and relatively anodyne. Maybe it’s a bit creepy. This sequence shows a common receipt from a coffee shop and explores what happens when we treat print as a highly flexible, context-sensitive, connected surface, and super quick by contrast to say video in broadcast. The receipt includes a mayorship notification from foursquare and three breaking headlines from the Guardian news feed. It turns the world of ticket machines, cash registers and chip-and-pin machines into a massive super-local, personalised system of print-on-demand machines. The receipt remains as insignificant and peripheral as it always has, unless you choose to read it. The large shop front shows a pair of sprites who lurk at the edges of the window frames. As pedestrians pass by or stand close, the pair steal colours from their clothes. 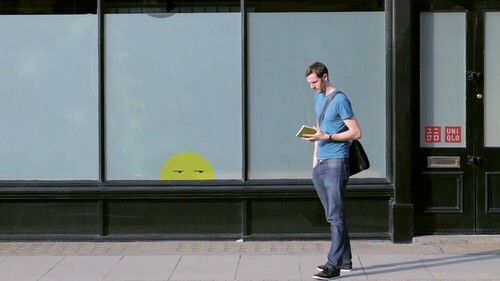 The sketch assumes a camera to read passers-by and feed back their colour and position to the display. Computer vision installations present interesting opportunities. Many installations demand high levels of attention or participation. These can often be witty and poetic, as shown here by Matt Jones in a point of sale around Lego. We’ve drawn from great work from the likes of Chris O’Shea and his Hand from Above project to sketch something peripheral and ignorable, but still at scale. The installation could be played with by those having their colours stolen, but it doesn’t demand interaction. In fact I suspect it would succeed far more effectively for those viewing from afar with no agency over the system at all. In contrast to a Minority Report future of aggressive messages competing for a conspicuously finite attention, these sketches show a landscape of ignorable surfaces capitalising on their context, timing and your history to quietly play and present in the corners of our lives. Incidental Media is brought to you by Dentsu London and BERG. Beeker has written about the films here. Thank you to Beeker Northam (Dentsu London), and Timo Arnall, Campbell Orme, Matt Brown, and Matt Jones! Really like the playful and ignorable, but can’t see many sticking to those rules. If the context was deep, then you might be onto something, but I’d imagine this sort of treatment would quickly descend to common denominators. The near-total disembodiment of Stephen Fry is slightly uncanny, yes, but in a good way. Second-order media cyborg, with something lost/transformed in the translation of inputs? Either way, deserves further investigation. Just promise you won’t do it to The Archers! At the end everything is going to be set up in just one device i liked the mixing media concept. Cool material guys keep on going! I really enjoyed the train schedule clicking updating interface, which would be a nice screen saver. A wonderful view again. Thanks! As neat as some of the tech was, I was disappointed and found the world that they’re proposing a noisy mess. The way they are trying to present their premise is rather “utopian”…but I think they’re more interested in the “gee whiz” factor of machines that “goof off” when not in use and cute animations that “interact” with you. Even their “playful”/”ignorable” screen scenarios still demand attention simply by being visual information. The human brain is wired to react to stimuli like audio and visual cues, and if all we’re doing is filling blank spaces with more “noise” (bouncy balls…Stephen Fry narrated Google image searches), that’s all that it becomes…more noise. Again…like the tech – it IS cute. However, in this world of more and more informational overload (which it sounds like they’re trying to address…and, in my opinion, failing at) people are beginning to value less and less “noise”, and are beginning to see the value in the concept of “silence” (a radio that is OFF, a blank piece of paper, a window, that is just a window). I love the notion that ‘print can be quick’ – transforming this traditionally slow and static media into something lively and instant is much needed. There’s a danger that flat media is becoming redundant in this new world of screens, but this shows a smart way for a brand to capitalise on the (social) content that is available to them and bring it into the temporal world. Nice videos, inspiring ideas. Minority Report a step closer. Here & There back on sale!